This is second abitmoreveg Shepherd’s Pie. Am I done with vegetarian shepherd’s pie? I don’t think so. This one is quite good. The photos don’t really do it justice but I prefer the filling of the ealier one. I don’t use yeast extract for this one. What I use instead is tamari sauce with mustard and red wine vinegar. This does not create any gravy-like consistency but it adds a nice savoury flavour. Quickly mince up the carrot, celery and onions in a food mixer. Peel and slice the potatoes thinly (about 1/2 cm) and put on to boil in a pan of water. Boil until they are tender enough that a fork will easily push through a slice. When done drain off the water and add a good splash of milk and enough butter to easily mash the potatoes. Leave aside until ready to assemble the pie. ** If you want to make a vegan topping, boil half as many potatoes, slice thinly, drain them and drizzle in olive oil, herbs, salt and pepper. While the potatoes are cooking, rinse the lentils well and place in a saucepan with twice their amount again of water, stir in the garlic cloves and half of the herbs. Bring to the boil, then reduce the heat and leave to simmer for 20 minutes until the lentils are tender and most of the water has evaporated but the lentils should still be wet not dry. Pick out the garlic cloves and discard. Peel, top and tail the onion, carrots and celery. Chop very roughly and place in blend. Blend until it is all minced. Slice the mushrooms and topped and tailed leek. Heat a little olive oil in a deep frying pan. Add the mushroom and leave to cook on a moderate heat for about 5 minutes. Add the sliced leek, stir in, cover and leave for a couple of minutes. Add in the minced carrot, onion and celery and stir around, sprinkle over a good pinch of salt, pepper and the rest of the herbs, stir around and then cover and leave for 2 minutes or until the veg is tender. Remove from the heat. If the lentils are done stir them in now. Gently stir in the tamari sauce, vinegar and mustard. Taste and add more salt and pepper if necessary. Grease a baking dish with a little olive oil, spoon in the lentil-veg mix, top with the creamy mashed potato, and sprinkle over the grated cheese. Bake in the oven for 20 - 30 minutes or until the top is golden brown. Remove from the oven and let cool for 10 minutes before serving - otherwise it doesn't slice as well. 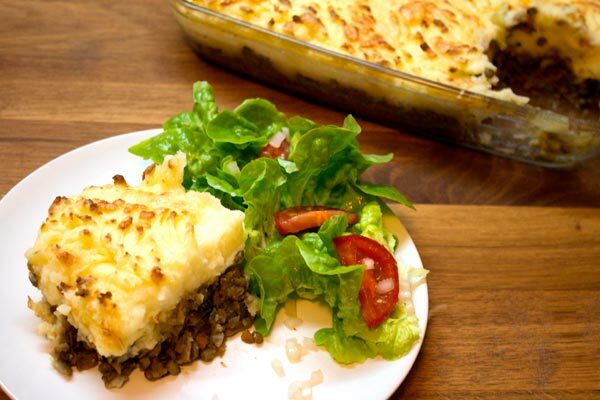 Vegetarian Shepherd’s Pie with a little salad.